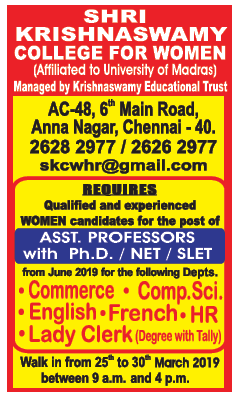 Shri Krishnaswamy College for Women, Chennai has advertised in THE HINDU newspaper for the recruitment of Teaching Faculty- Lady Assistant Professor Plus Non-Faculty jobs vacancies. Interested and eligible job aspirants are requested to walk-in from 25th to 30th March 2019. Check out further more details below. About College: Amarar Thiru. M.A. Krishnaswamy, A.M.I.S.E., M.I.C.E. (U.S.A.) F.I.M.I., a revered educationist par excellence, was born on 17th March 1913 in an agricultural family hailing from Manamadurai, Sivagangai District, Tamil Nadu. After a brilliant academic record in school and college, he began his career as a school teacher. He started acquiring his professional degrees through self study. After a brief stint as a school teacher he started a Private Engineering College in the name “College of ‘Engineering Technology” to give coaching for Diploma Courses in Civil, Mechanical, Electrical, Automobile Engineering and Air-conditioning & Refrigeration. How to Apply: Interested and eligible candidates are requested to attend the Walk-in interview along with CV, originals & copies of certificates and recent passport size photo the walk-in address given below.